This piece is a physical embodiment of the dichotomous relationship between human and animal. I thought of a manifest object, where in a literal sense, the animal exists as utility item within the domestic human space. Structurally and in terms of scale, the piece follows or approximates the typical dimensions and vaguely the aesthetic archetype of a medicine cabinet. 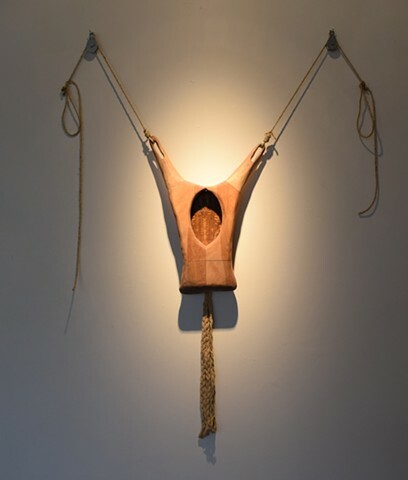 I was interested in the idea of an irrational object that typifies the cross-pollination of human ecology and the animal body, suggesting an exploration of ideas of the “Other” like utility, fetishism, luxury, objectification and commodification. The object’s purpose and character is ambiguous and reflects the fluid categorical spectrum that the animal exists within, as both object and agent. The piece embodies the process by which the animal becomes “the other”, and generally explores the implications of ethical relativism.